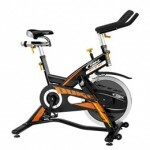 The BH Fitness Duke is a full commercial indoor cycle.This bike is ideal for anyone who wants the best for home use. It also has a full commercial warranty making it suitable for even the most advanced classes.Frame: New oversized steel frame has been specially treated for corrosion resistance and then powder coated for extra protection. Transmission System: 6PK belt drive assures performance that is smooth, quiet, and low maintenance. No Chain means you and the bike stay cleaner with no oiling. Multi-purpose pedals: Pedals feature both standard baskets and cycling shoe clips. Handlebar: Ergonomically designed for the best fit and maximum comfort the handlebars adjustable both horizontally and vertically.